It’s Taco Tuesday! Okay, I’m not making tacos, but it is a Mexican dish. And…I have to admit it wasn’t planned. I just happened to have a craving for something spicy and because I had all the ingredients on hand, it worked. In a medium bowl, combine the chicken, cheese, and garlic. Roll this mixture into the tortilla shells and place into a greased 9×13 pan. In a saucepan, melt the butter then add the corn starch. Stirring constantly, cook for 1-2 minutes. Slowly add the chicken stock whisking continuously until the corn starch is cooked and the mixture begins to bubble. Add the remaining ingredients and heat thoroughly, but do not boil or the sour cream will separate. 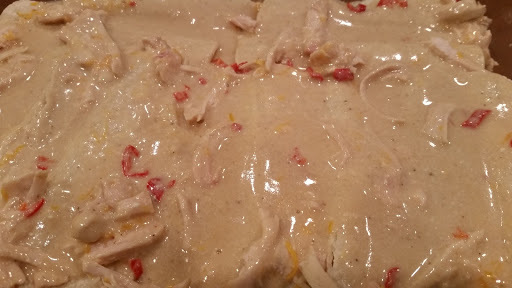 Pour the sauce over the prepared chicken tortillas. Top with cheese and bake for 25 minutes until it is bubbly and the cheese is browned.